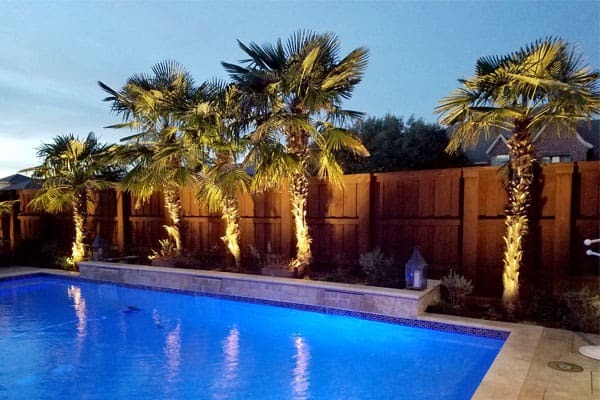 You can get a great new look for your Coppell yard with the right landscape lighting, but there are some things to consider before you start lighting up your space. First, you need to determine a plan for your lights. Think about what you want to accomplish, and what kind of landscape lighting might provide that for you. Low voltage outdoor LED lighting is very popular because it is easy on the electric bill and cool to the touch. With cool lighting, you don’t have to worry about the plants getting damaged when you place lights close to them. Many plants are temperature sensitive, and you don’t want to put them at risk. Choosing the right lighting can help. Additionally, how well your lights hold up to the Coppell weather and the elements matters. Many landscape lighting is very durable, including low voltage options. The quality and durability of your lighting are important because it can help you avoid spending additional time and money to repair or replace parts of your outdoor lighting system. With LED lighting that lasts a very long time, you won’t spend your time changing out light bulbs or checking to see if all your lighting is working the way it should be. Instead, you can just enjoy your yard, day or night, and appreciate all the natural beauty that can be enhanced by the right landscape lighting. Whether you’re focused on enjoying the quiet of your yard by yourself or you want to have a dinner party outdoors, low voltage outdoor landscape LED lighting can give you great options. Ready to get started on some LED lighting for your yard? Please contact us, and we’ll help you create a landscape lighting plan customized for your home, outdoor space, and budget. Living and working in Coppell, TX can be great. The city is vibrant, and its proximity to Dallas means there is even more to do. Legoland Discovery Center is there, along with Grapevine Mills, Black Walnut Café, Coppell Nature Park, Trinity River Kayak Co, and more. 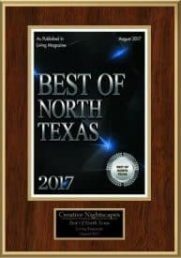 You’ll never be bored in the Coppell area, whether you have kids, are retired, or are single. There’s something there for everyone. If you like to play golf, or you enjoy getting a massage or having a spa day, you won’t have to leave the area to get those kinds of things. There are great restaurants downtown and in other parts of the city, along with medical care and good schools. When you choose Coppell for your home, you get the best of both worlds. You can stay close to your house and spend time with family and friends, or head out day or night to do something fun. Having those options close by matters to a lot of people, and if it matters to you than Coppell can be among the best choices in the Dallas area. If you need something Coppell doesn’t offer, heading into Dallas doesn’t take long, and it gives you access to just about anything else you can imagine. Excellent service, excellent outcome! Beautiful work done on time and efficiently. Our new lights were beautifully laid out and professionally installed. Makes such a difference in the nighttime appearance of our house. Very good at communicating with me. Returned calls promptly. Did a good job "problem solving" our project. Patrick and George spent a great deal of time walking the property, coming up with ideas for fixing and improving an existing (crap) lighting system installed by another firm. The gave an estimate for each part of the project and I was able to select what I wanted fixed and installed. In addition to fixing existing lights and suggesting new, creative idea for lighting, they recommended re-puposing some unnecessary existing lights to add lighting in other areas. The crew was friendly, thorough and did high-quality work. And George and the crew were patient and accommodating with adjustments. Installed Kichler LED outdoor lighting at home in Northlake Woodlands. Mounted hardscape lights and down lights in trees to create moonlight effect and illuminate driveway, walkway, step, trampoline, tree house, and yard. Installed Kichler LED outdoor lighting at home in Peninsulas of Coppell. Mounted down lights in trees to create moonlighting and illuminate yard, BBQ area, and seating area. Placed up lights to accent tree canopies, planter, and art. Set path lights to highlight steps, walkways, landscape greenery, and boulders. Installed kichler lighting system on home in coppell. Up and down tree lighting in backyard and pool area. Designing a lighting system for home in Coppell. Front facade lighting and down lighting from large Oak tree to highlight yard area below. Installed Kichler LED outdoor lighting at home in Grand Cove Estates. Placed up lights to accent tree canopies, facade of home, and front entry. Removed existing fixtures and installed Kichler LED landscape lighting at home in Shadow Woods Estates. Placed up lights to accent facade of home, peaks, and columns. Mounted down lights in trees to create moonlight effect and illuminate steps, walkway, and yard. Installed Kichler LED outdoor landscape lighting at home in Westhaven. Set path lights in landscape beds to illuminate walkway to front entry, steps, and landscape greenery. Placed up lights to accent facade of home, tree canopy, and side yard. Installed Kichler LED lighting at the entrances of Old Coppell Estates. Placed up lights to illuminate signs and accent tree canopies. Set path lights to highlight landscape greenery. Upgraded existing down lights illuminating the areas just inside the gates. Installed several new Kichler LED fixtures, upgraded existing lighting to LED, and removed high voltage builder lights at home in Creek View. Installed Kichler LED landscape lighting. Placed up lights to accent walls, peaks, entry way, trees, fence, and art. Mounted down lights to moonlight driveway, seating area, pool deck, walkways, planters, and bamboo.